The same technique as is articulated in this blog could equally be leveraged to do the equivalent of a mail merge, whereby items in a SharePoint List with email contact details could be processed through dynamically generating a PDF document and then emailing each of those contacts in the list by simply starting a single flow. Caught your interest yet ?? First let’s check out a demo of what this solution might look like. 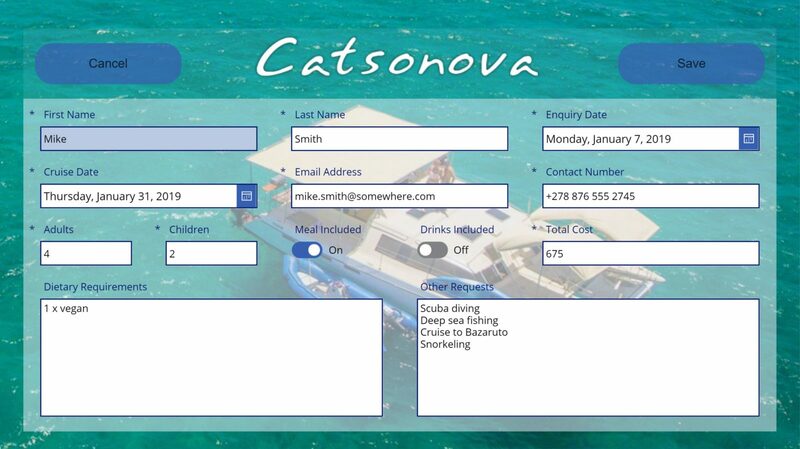 Sadly building a demo app such as this one is most definitely nowhere near as awesome as actually going on the cruise ?. 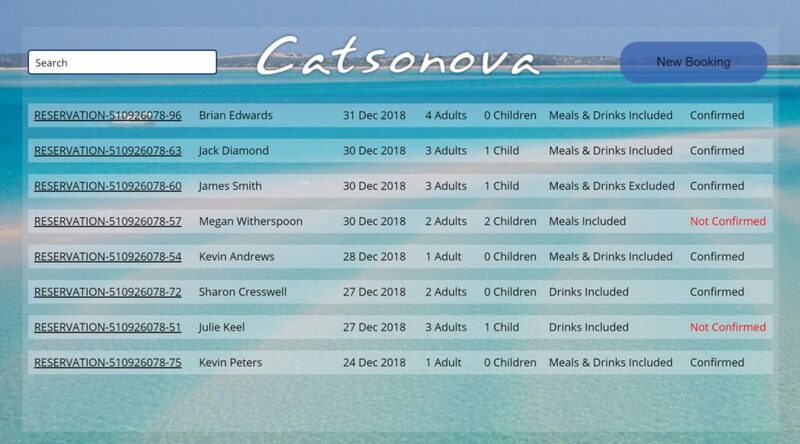 Castonova Cruises is a real business located in Vilankulo, Mozambique. It ranks right up there with one the most beautiful places in the world I at least have been to, second only to Maldives. If you ever get an opportunity to visit, I highly recommend taking a cruise to the nearly Bazaruto Islands with great snorkeling, scuba diving and occasionally you’ll even pass by a pod of dolphins. The app demonstrated in this blog is in fact very simple. It consists of a single screen that displays a gallery linked to a SharePoint Document Library. When the New Booking button is clicked on, the gallery control is hidden and a form linked to a List in SharePoint is displayed. The demo saves new bookings to a List in SharePoint which is in essence no more than a temporary “staging” container for the booking information that is easy to save to from PowerApps. As soon as a new bookings is saved to this list, a Flow triggers to generate the actual document which is saved to a document library, following which the list item created in PowerApps is then deleted in the Flow. The Document Library in this demo solution contains the same set of metadata fields as the corresponding list contains. 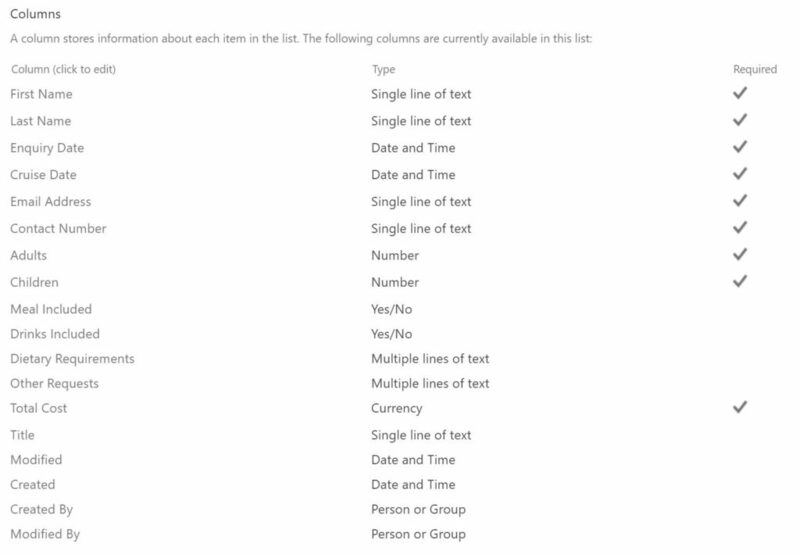 In this document library a “template” booking form document is copied to a new document when a new booking list item is saved, and the properties for the new document are updated with the values specified when the booking is saved in PowerApps. 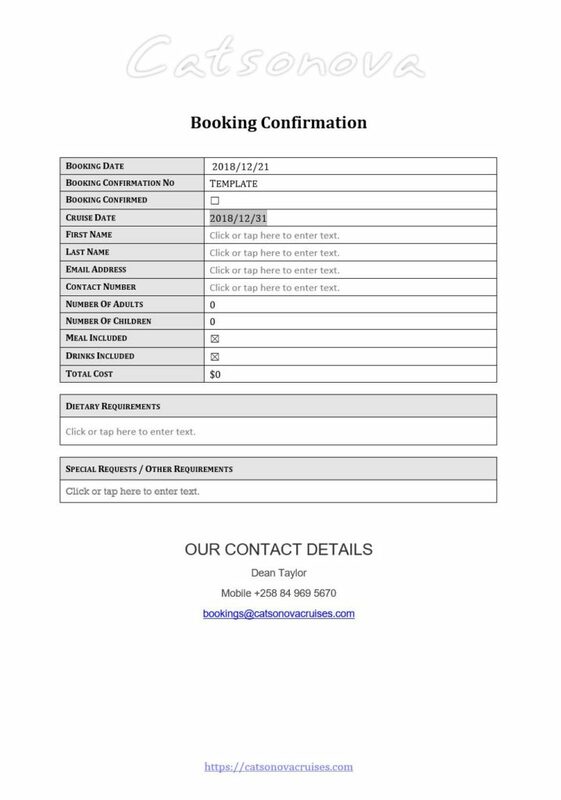 For this demo I activated the SharePoint Document ID feature in the site collection features, such that each new booking created would have a distinguishable booking reference, i.e. “RESERVATION-….“. Insofar as this demo solution is concerned, the Microsoft Word document template is essentially a “report” template for the booking confirmation document that will be emailed to the person who placed the booking for a cruise. This component is quite possibly the most complex part of the solution, so for the average Citizen Developer out there building this solution should be a piece of cake ?. 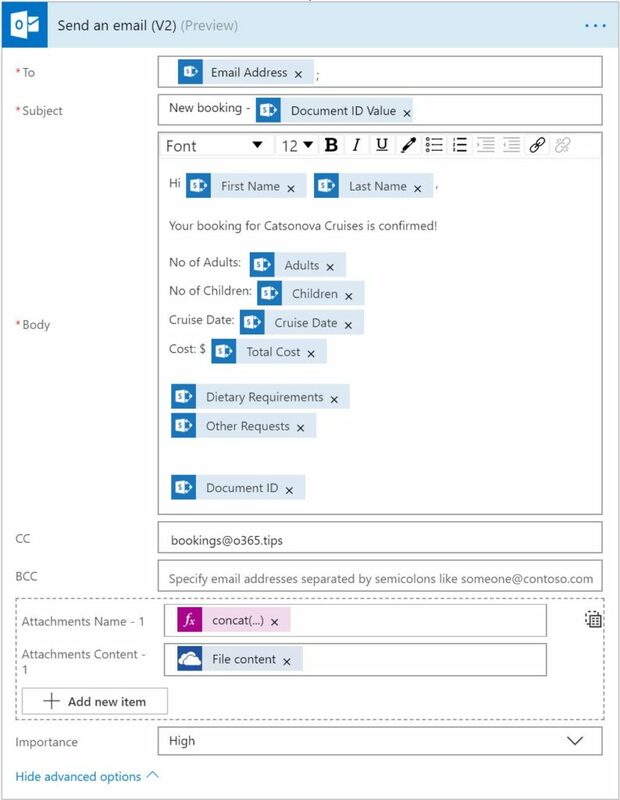 The key difference being that this demo at least is picking up booking information captured in PowerApps and saved to a SharePoint List, and equally hence why this solution could quite easily be considered a baseline pattern to leverage for implementing a mail merge solution. The Microsoft Word document template is by and large similar in nature to how you would create a document template for a mail merge to email out to a number of contacts typically from a corresponding Excel workbook. Once you have created the SharePoint Document Library (including the metadata fields), you can create a blank document in Microsoft Word, upload it to that document library, following which download that same document back to your workstation. The reason for doing is this is because the “blank” document you download from the document library will then allow you to utilize the metadata fields for placeholder values in the document whilst you modified that template document to look as so choose. 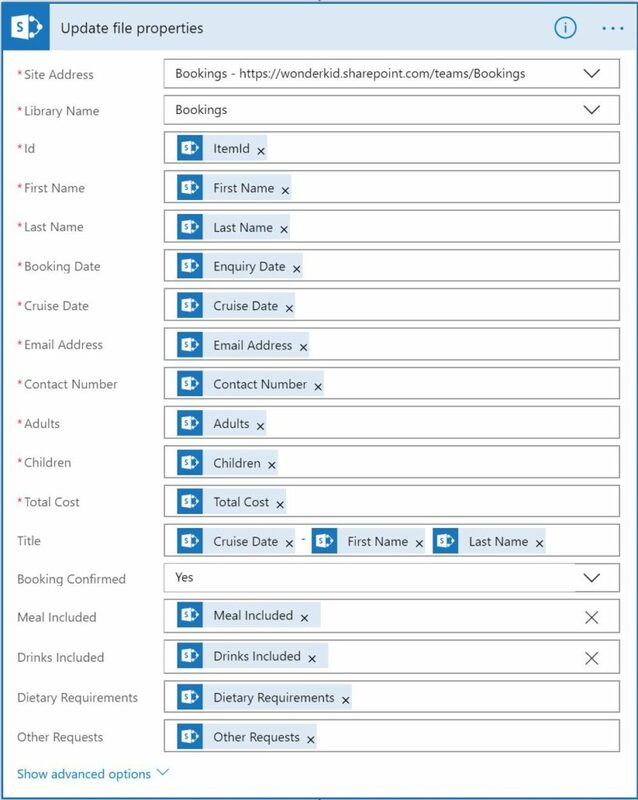 You can nonetheless equally start off with an existing document template of how you would like your booking form “report” to look and then upload it to the SharePoint document library and then download it back to your workstation (inclusive of the metadata fields) should that be your preference. One great benefit of this technique is that should you in future wish to modify the layout of the document template or perhaps add additional metadata fields, you can always modify the original template and override the previous template by simply uploading the updated template back into the SharePoint document library, replacing the previous one. No developer required! 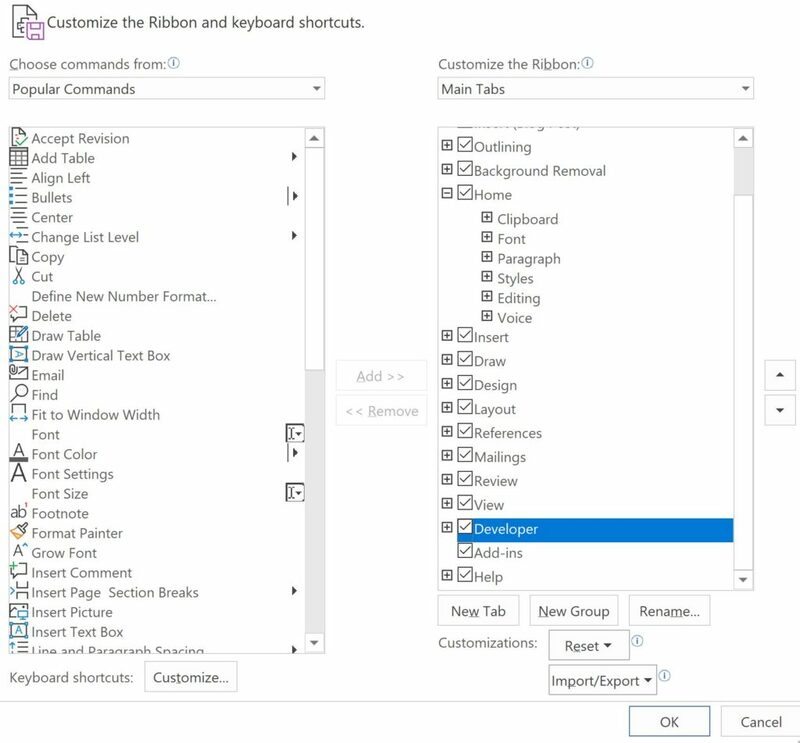 Before you can start customizing your template in Microsoft Word you will need to add the Developer tab to the Ribbon in Word. To add the Developer toolbar to the Ribbon in Word, right click in an empty space on the Ribbon and click “Customize the Ribbon…“. To do this right-click in an empty space and click on the “Customize the Ribbon…“. Having added the Developer tab to the ribbon, you can then design your document template however you so choose. 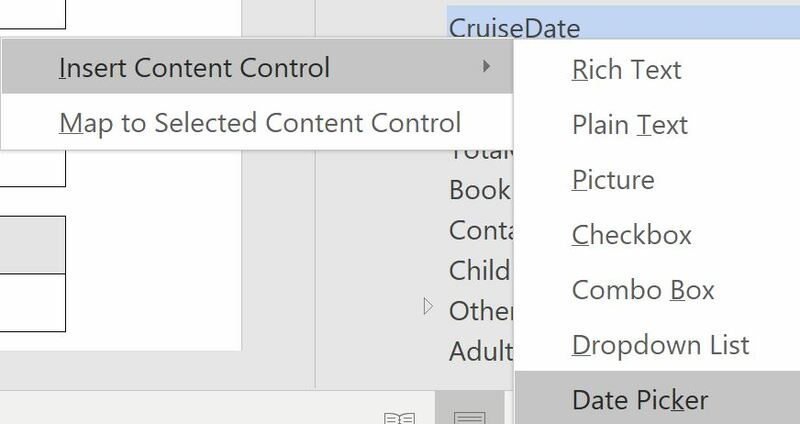 In your document template, where ever you would like fields captured in you app automatically populated in placeholders in your template document you will need to insert Content Controls / XMLNode Controls. As this is well documented by Microsoft, I won’t delve into too much detail on this, other than explaining by way of example how I implemented a couple in the demo template shared above. Albeit that the above link pertains to development using Visual Studio, the broader technique can equally be applied for this particular use case. Just ignore all the complex stuff in the above links ?. In the table row for “Booking Confirmed” click on the 2nd column where you’d like to insert a check box to indicate the booking has been confirmed. Next on the Developer tab on the Ribbon click “XML Mapping Pane“. This will bring up a popup window with a dropdown list. Right click on the field you want to insert as a placeholder. In this case I’d like to add a checkbox to reflect the value of the Booking Confirmed field. Now that wasn’t so hard was it ?? 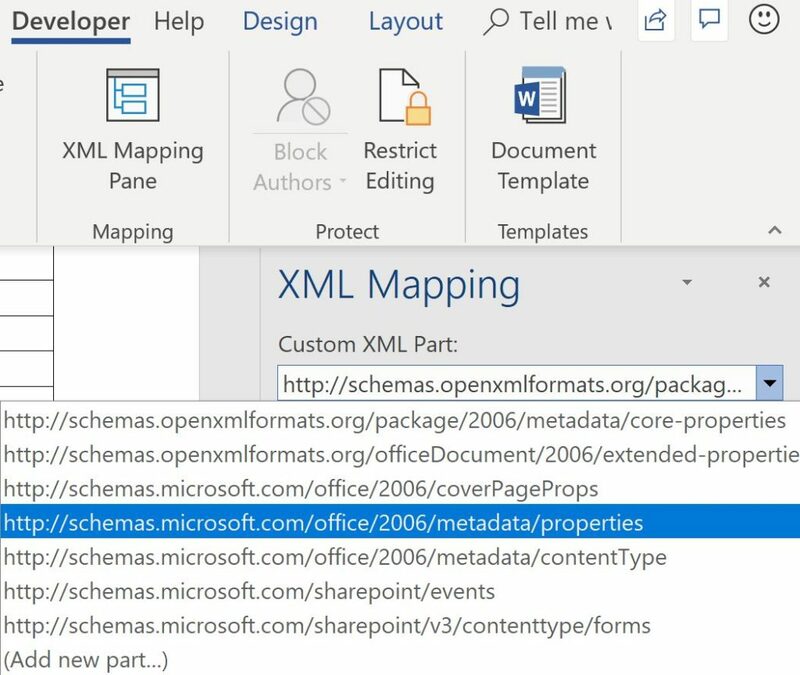 Once you have finished mapping all the metadata properties and building your template, give your document a meaningful name and upload that back to the SharePoint Document Library. You’ll need to use the name of the template in the Flow detailed in the next step. And now the final piece of the puzzle where the rest of the magic happens – the Flow that pulls it all together. Looks relatively simple doesn’t it? Well figuring out each of those steps isn’t that easy, however that’s why there are blogs such as this one to help you create it LOL! The first step in the follow is nothing more than creating a Flow that triggers when a new item is added to a list. 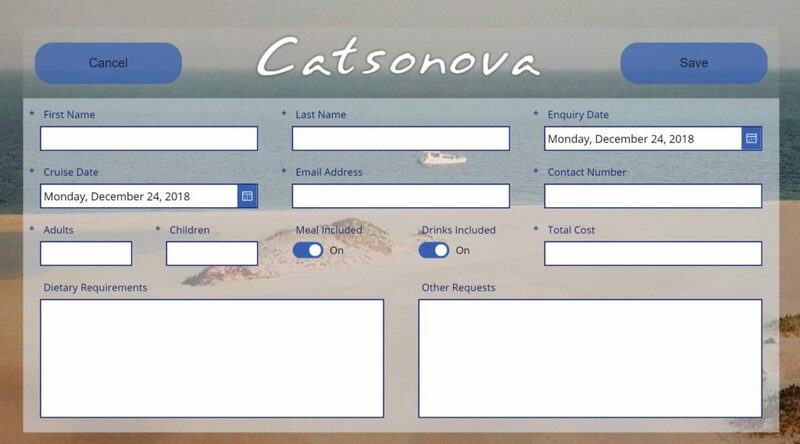 In the demo app for this blog the list is called “Booking Enquires” located in a team site I called “Bookings“. The 2nd step is again really simple. 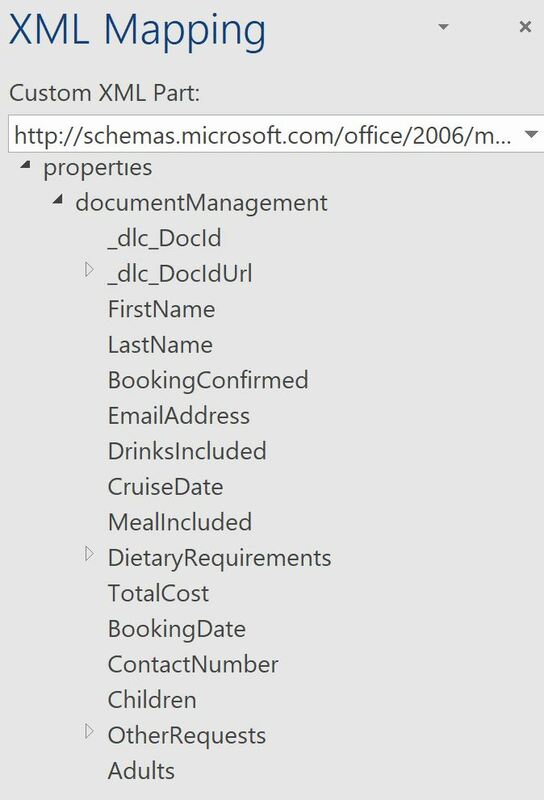 I used the “SharePoint – Get item” action to retrieve the metadata information for the item inserted into the Bookings Enquires list. In the 3rd step in the flow I used the “SharePoint – Copy file” action to make a copy of the template document we’ve set up in a SharePoint document library I named “Bookings“. Wow isn’t this easy? In the 4th step in the Flow I update the metadata properties for the template document I made a copy of in the 3rd step with the corresponding metadata column values as was saved as a new item into the “Booking Enquires” list. 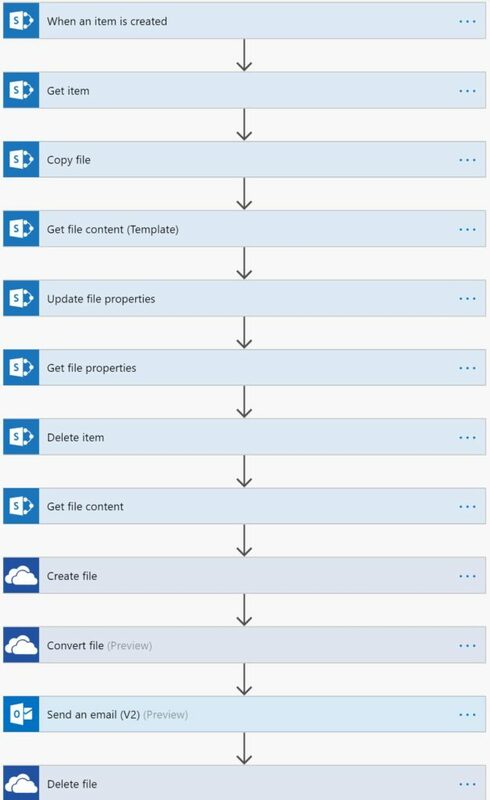 In the 5th step in this Flow I call the “SharePoint – Get file properties” action. The primary reason for including this step in the Flow is to obtain the unique “Document ID” value (aka “OData__dlc_DocId“) for the copy of the template file copied, such that we can share a more meaningful reference number, referred to as the Reservation Number, later in Step 8 and again in Step 10 of the Flow in the email we send to the person who placed the booking. As we no longer need the list item created that initially triggered this flow, in this step in the Flow the new list item can be deleted. This is optional and not essential for the purposes of the overall demo solution. Now that we have populated the metadata fields (“Step 4“) for the new file we copied from our template document (“Step 3“), we can now copy the completed Word document elsewhere, in this case OneDrive for Business. The reason for doing this is because a new action (in Preview) available in OneDrive for Business (“ODFB”) enables you to convert documents to PDF format and currently at least this action is not available for documents stored in SharePoint. Here I use the “One Drive for Business – Create file” action to emulate copying the file from SharePoint to ODFB using the file content from the previous step in the Flow. For the File Name I use the unique Document ID from “Step 5” for the file name & appending “.docx” to the value of the Document ID property. In this step I added an action “One Drive for Business – Convert file” which enables us to convert our now complete Word document to a PDF document, which most people would prefer to email a document such as the Booking Confirmation. I must at this give a SHOUT OUT ? to Shane Young for the video he posted on YouTube “PowerApps PDF Generator using Microsoft Flow PDF Converter” as I recently viewed his video, and quickly realized that leveraging native functionality to convert document to PDF would most certainly be a recommended approach over other techniques I have early blogged on. At this point we now have all the content and information to send the Booking Confirmation email. I used the “Office 365 – Send an email (V2)” (preview) action to send that email along with a Booking Confirmation PDF document to the person who placed the booking. The “Attachment Content – 1” – “File content” is the output returned from the previous step in the Flow. In the final step in the Flow I delete the file “copied” to ODFB as we no longer need this. That’s it – we’re done! With just a little additional work, once you done all the other work it shouldn’t take you too much more time to create of mobile version of your app ?. Personally I think it is pretty awesome what can be achieved with the combination of Office 365, PowerApps and Flow nowadays. Feel free to share your comments and thoughts on this solution as I am always interested in hearing other viewpoints! Merry Christmas to ya all ?. This is a great article! i spend most of my days this past month doing nothing but trying to learn PowerApps. Currently, I am working on some large scale projects for storing Policies and Procedures and being able to start with one department first. My plan is to have a first filter screen by Division catalog and then to the available policy or procedures which can also be searchable. Being able to see what you have done, including your next blog post I believe I can achieve this. If you would have any suggestions for me I would greatly appreciate them.